Welcome to Bliss, the Bridal Capital of the Midwest! 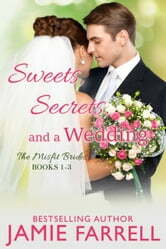 "Farrell marries warmth with tongue-in-cheek wit in this marvelous romantic comedy." PUBLISHERS WEEKLY STARRED REVIEW of Blissed, Misfit Brides Book One. Sweets, Secrets, and a Wedding includes the first three romances in the Misfit Brides series, complete with two all-new extra epilogues! Blissed: A single mother and a love-shy widower reluctantly unite to save Bliss’s annual wedding festival. Matched: An out-of-place divorce lawyer is accidentally reunited with her first love. Smittened: An ice cream shop owner and a bad boy drummer find a rocky road to love. And don't miss the Officers' Ex-Wives Club series!